Today's Top 10 is a guest post from Selena Eaqub, an economist and co-author of Generation Rent - rethinking New Zealand's priorities. She has previously worked for Goldman Sachs JBWere, the Reserve Bank and Statistics New Zealand. As always, we welcome your additions in the comment stream below or via email to david.chaston@interest.co.nz. 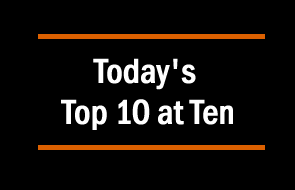 And if you're interested in contributing the occasional Top 10 yourself, contact gareth.vaughan@interest.co.nz. 1. Recent dip in New Zealand dollar. The New Zealand dollar dipped after the United States (US) Federal Reserve signalled an interest rate increase, as reported by the NZ Herald. US news is heavily influencing NZ sentiment right now. Markets are waiting for information on the Federal Reserve and US policies. The graphs below shows the slight dip of the New Zealand dollar vs the US dollar from February 2017. The exchange rate has been trending up since September 2015. 2. Concern over US protectionism. Our Reserve Bank is worried about the US putting up trade barriers, and rightly so. The United States are the 3rd largest buyer of exports, amounting to over $5 billion in the year ended January 2017. Trump made a tough stance on trade during his election campaign. One of the smallest central banks among the developed economies has become one of the loudest in warning about the risks of rising global protectionism led by the Trump administration in the US. Reserve Bank of New Zealand Governor Graeme Wheeler said in a speech today the biggest risk internationally is a potential rise of tariff walls around the world’s largest economy. “The greatest source of uncertainty relates to the US administration policies in respect to its ‘America first’ policy platform,” he said. News here will be critical for NZ, particularly exporters of meat, dairy, and wine as shown below. 3. US-China trade war downplayed. President Trump threatened to impose a 45 percent import tariff on goods from China. If he doesn’t go through with his threats, this would be positive for NZ. China is our largest trading partner and any slowdown in their economy will be felt in ours. This would affect dairy, forestry, and meat the most. 4. Global stockmarkets still booming. The global stockmarket is doing well as economies recover, as reported by the New York Times. An economy that seemed locked in some form of “secular stagnation” or “new normal” is at long last showing some signs of being in something closer to an “old normal.” The United States manufacturing sector is showing strength, and the broader mix of market and economic data from around the world in the last few months also points to a world where a vicious economic cycle isn’t looking quite as scary and may even be ending. There can be no assurance that this pattern will continue, and there are some things to worry about on the horizon, not least that the Trump administration could follow through on some of its threats to disrupt global trade and diplomatic relations. Long-term interest rates remain low by historical standards across most of the world, suggesting that global bond investors aren’t fully buying into a return to stronger, more consistent growth. Much of the confidence also comes from potential business friendly Trump policies in the form of corporate tax cuts and deregulation. As shown below, US confidence is high despite uncertainty on the policies. 5. Workplaces unprepared for technology changes. "We've had a fairly good idea of what a good, high performance workplace looks like since the mid-1990s…. "But still only a minority of firms have picked that up." Gahan said he was often amazed by how little senior leaders knew about trends and changes which were often widely discussed and in news media. Business leaders were not good at seeking advice and often worked in isolation, which meant they were often having to be reactive, rather than proactive to new trends. Instead, organisations should look to leverage and take advantage of disruption in their industries. "Try to find examples of companies in their sector that have been innovative and understand how. "Make sure they're one step ahead of the game and adapting now, because it will definitely be cheaper, easier, less costly to adapt proactively than waiting to adapt in response to some disruption that might happen. "There are some scary and, if you like, disruptive and risky elements about what's happening, but actually there are some incredible opportunities for many businesses in the future." This seems particularly relevant today because technology changes are becoming more rapid. The article also debunked the theory that robots will take over jobs. There are more jobs created than destroyed. 6. Cash best for children in poverty. Dr Jess Berentson-Shaw showed an interesting chart about what works to make low-opportunity children thrive. It shows that unconditional cash assistance provides the best outcome. 7. Britain prioritises trade deal with NZ post-Brexit. "It's very encouraging that British businesses rank a number of Commonwealth countries very highly. "I mean, 79% of all British businesses polled want a trade deal with New Zealand and we would urge the British government to listen to these findings and start getting on with these deals." Britain is our sixth largest exporting country, with exports of about $1.4 billion in the year to January 2017. Meat and wine are the largest exports to the UK. The general election is less than seven months away and hopefully there will be some interesting policies for us to consider. The London School of Economics and Political Science has some lessons on how to increase public support for policies. It says that for a policy to be successful, it must be palatable for citizens. If it doesn’t fit within their views, it requires leadership and being able to change their minds. The latest policy on superannuation missed the mark both on the policy frame and the public frame. Our framework combines insights from scenario planning and frame analysis. Scenario planning starts from the premise that we cannot predict the future. We can, however, imagine different plausible scenarios, different plausible future developments. Scenarios can be used to ask a ‘what if’ question. If a certain scenario were to develop, what policy measures would be required? By the same token, scenarios may be used as test-conditions for policy-measures. Kees van der Heijden calls this ‘wind tunnelling’. Frame-analysis is about how we interpret the world around us. Frames are mental structures that shape the way we see the world. Based on a frame, an individual perceives societal problems, attributes these problems to causes, and forms ideas on instruments to address the problems. Our central idea is that policy-makers may use citizens’ frames to reflect on their policy frame. Citizens’ frames may, in other words, be used to test conditions in a wind tunnel. The line of reasoning is summarised in the figure. The method asks the policy maker to understand the way that citizens envisage a problem and they can change the policy accordingly. For example, adjust the policy or try to change the minds of citizens. This will be critical in the current age of populism – politicians have to find a way to either make policies palatable, or convince the public that the policy is needed. NZ underinvests in public broadcasting. This study in Canada looks into the Government’s role in broadcasting. In most countries, the Government must step in to fulfil content that private organisations miss out. The study found that NZ was high on the list in terms of the potential benefits of public broadcasting (Figure 1), but we spend less per capita than many other countries (Figure 2). 10. Sharing economy? Not so much. When Uber and AirBNB (rents out cars and homes) became popular, there was a lot of talk about how sharing economy was going to be the future. This Vox article explains that while it works for renting cars and homes, it hasn’t worked for other types of lending. There are still other businesses that are trying, but peer to peer lending is not as widespread as anticipated. Even the three best-known “sharing economy” companies have found there are limits to peer-to-peer sharing. Asking early adopters to share is a great way to bootstrap a new online business. But beyond a certain point, continued growth often requires professionalization. Serving a big, mainstream market requires people to invest in new capacity, not simply rent out whatever spare capacity they happen to have on hand. Sharing isn’t going to go away — there will always be people who want to make a little extra money on the side with a car or a spare room. But the past few years has made it clear that Lyft and Airbnb have not invented a new economic model that’s going to transform capitalism. One reason it works for Uber and AirBNB is that cars and homes are people’s most valuable assets. It wouldn’t be worthwhile to rent out a power tool for example because by the time you paid to rent the item and delivery fee, you may as well buy one. Selena is Shamubeels wife obviously! They must have great bed talk, I would say. Imagine being married when both are economic analysts, as they generally can never agree on anything! In his book on zombie towns Shamabeel suggests migrants (engineers) to reinvigorate the regions. The message attempts to justify globalism. The Transport Blog is the same and politically attuned to the Green Party. Globalisation stage two. Migrants living in the towns abandoned by locals. I can see this becoming a big thing. Any nation should defend itself against poor immigrants. The problems faced by others should not be loaded on to locals. I agree, and anyone who has been to China can understand why New Zealand would be appealing. BY that I mean it's hard to comprehend how much stress 1.3 billion people put on the local environment without seeing it, firsthand. The U.S stockmarket is indeed boomming.254% Rise since March 2009 and looks as though it could continue. As long as we ensured local citizens own the land and value adding assets - we would be rich and healthy. left out the biggest export to China - the future prosperity of Gen X and Y (in the form of rent).